I can’t think of a better way to ring in this beautiful fall weekend than to make this creamy smoothie packed of good-for-you ingredients. It’s a spin off my popular Pumpkin Pie Smoothie for Two and as much as I love the previous smoothie, this one wins by a landslide. This version today is also made without banana, so those of you who asked for a banana-free version will be able to enjoy it too. I got your back! Instead of going the pumpkin route, I decided to make use of some freshly roasted butternut squash –always a good idea! 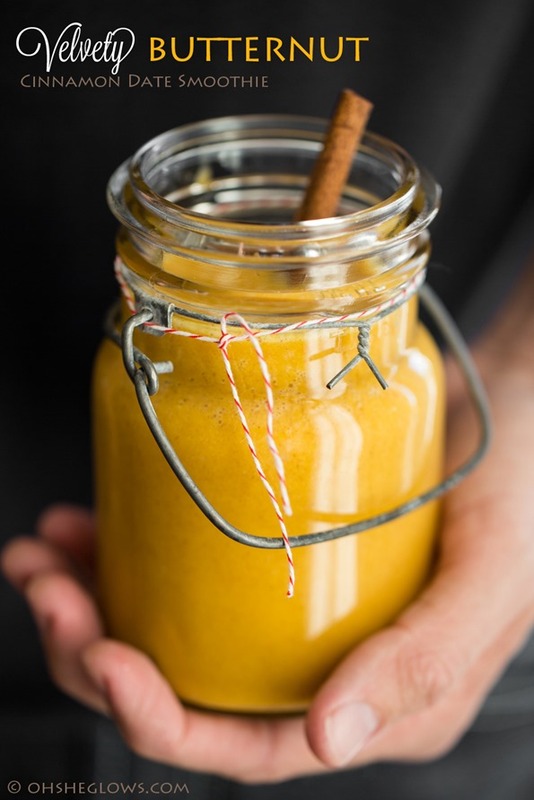 Roasted squash tastes downright dreamy in this smoothie, but if you want to use canned puréed squash that should work just fine too. Just promise me you’ll get this in your belly stat. Creamy, velvety, and downright dreamy this is the perfect smoothie to kick off the fall season and make use of roasted butternut squash! This batch makes a generous amount - enough for two glasses to share with a loved one (or one thirsty smoothie maker!). You can also make this for a Thanksgiving brunch and share it with a crowd. It would make a lovely addition to any breakfast. If you'd like to use canned squash that should work fine too. I would use a bit less, about 3/4-1 cup of purée, adding to taste. It probably goes without saying, but pumpkin would be a nice substitute for butternut. Adapted from Pumpkin Pie Smoothie for Two. 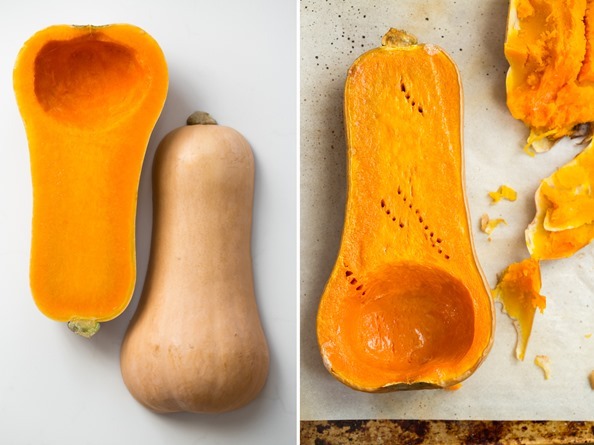 To cook the squash: Preheat oven to 400°F and line a baking sheet with parchment paper. Slice the stem off the squash (optional) and slice the squash in half lengthwise. Scoop out the seeds with a spoon. Brush a bit of oil on the squash and sprinkle with a pinch of salt. Place squash on the baking sheet, cut side up, and roast for 35-50 minutes, until fork tender and golden brown on the bottom. Allow to cool. For the smoothie: Add all smoothie ingredients into a high speed blender and blend on high until smooth, adjusting the spices as needed. Serve immediately & enjoy! Note: To make this nut-free, use a nut-free non-dairy milk such as coconut or soy milk. P.S. – Thank you a million times over! 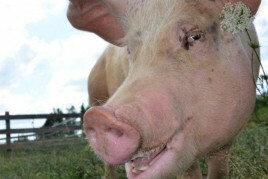 Find out more about farm Sanctuary’s “What Did U Do?” campaign in Monday’s post. Ahh, makes sense. Thanks, Angela! I want these in my belly right now! LOVE butternut squash and adore the idea of it in a smoothie! I’ve recently been thinking of using frozen cubed butternut squash in a smoothie and I’m glad you’ve taste tested for me and confirmed its definitely a good idea! 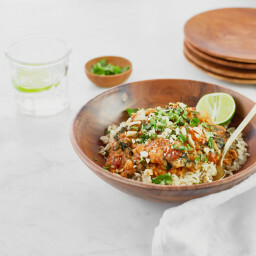 This looks delicious, I love how you used dates instead of bananas. Recently I have been drinking Apple Pie smoothies for breakfast but this will be a nice change. I imagine it would be delicious slightly heated as a warm smoothie in the winter or as a dessert with granola sprinkled on top. 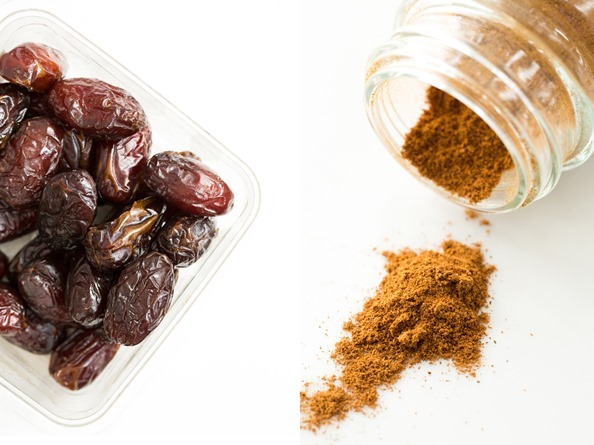 Oh my goodness…you used dates AND squash! You are queen of culinary awesome! Putting dates on the grocery list! This is beautiful Ange! I love me some of the b-nut and have been incorporating it as much as possible these days, but have yet to throw it in a smoothie! This looks so delicious, and perfect for fall. Can’t wait to give it a try! Great way to start the season, I love the color of the smoothie very bright and ready to drink..
We must be on the same brain wavelength because I was JUST thinking about a butternut squash smoothie! Also, dates are my favorite sweetener by FAR! sounds rich and delicious! oh and i made a pumpkin pie milkshake! What a fun, unique recipe! I love the versatility of smoothies, but would have never thought of using butternut squash. I can’t wait to try this! I am butternut squash obsessed but have never thought to have it in a smoothie. I might need to give this a go! We finally have butternut squash at our farm. Can’t wait to whip up this smoothie. Thanks for another lovely recipe Angela! How unique! I would’ve never thought to put butternut squash in a smoothie before. Sounds amazing! 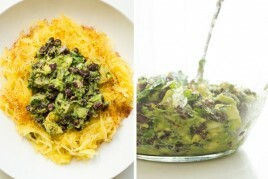 I bet this would be amazing with kabocha squash too! I probably it even more than traditional pumpkin because it’s naturally so much sweeter. when I saw the picture on Facebook i thought it was the soup again. Definitely going to be getting our beta carotene on! This looks mighty tasty! I have about 1/4 of a butternut left, going to roast it and hope it’s enough for a smoothie for 1! 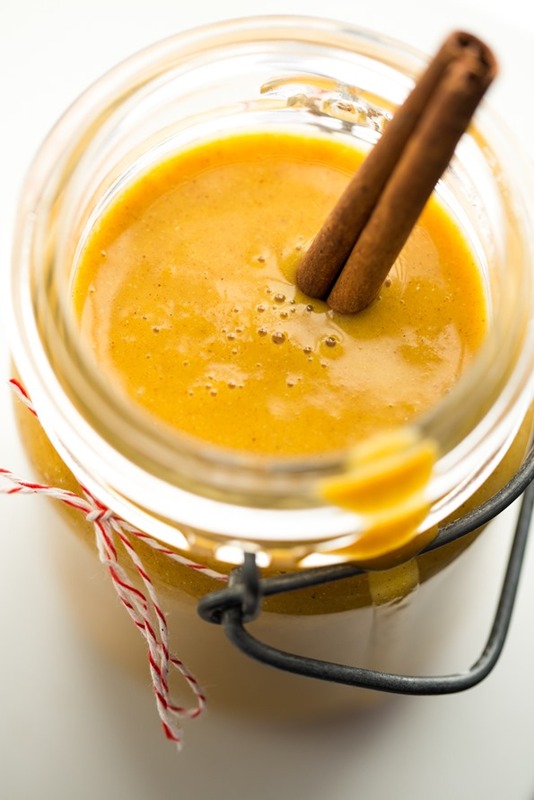 I love using winter squash or sweet potatoes to make smoothies even creamier! I stated doing butternut a few years ago when I broke my jaw (I couldn’t only drink my carbs!). It was similar to this, but I used frozen cherries instead of dates. It was like a Cherry Bomb! Uhm… so tempting! Never used squash to make a smoothie, sounds very cool! I am so excited for this! I do love the pumpkin smoothie, but I just haven’t gotten around to it yet. I love the idea of dates instead of banana and leaving out the oatmeal. This sounds so rich and delicious! I think I have all the ingredients on had too! And then I was all like “WHOA GIMME THAT SMOOTHIE.” Brilliant! hah…I’d make an exception and share with you! It looks great and it could almost double as a soup if it was served warm. Or serve it as a chilled soup. Or as a dip with toasted bread. This is SUCH a versatile recipe, Angela. Love it. Pinned! This looks delicious! I am so glad there are so many uses for winter squash. I am always looking for more. Thanks to you as well for teaching me how to cook a squash! Whenever I tried to make them before they were only half cooked and hard…mmm? Keep up the awesome work! I’ve never cooked a squash before but I was determined to try it this weekend to make baby food…and now a second use for leftovers that looks amazing. Very excited! Thanks for the recipe. This is gorgeous! I can’t wait to try this recipe. I was also wondering what recipe plug-in you use? It looks great. Thank you :) My husband created the plug in for my blog! This looks fantastic! I am planning a surprise Fall bike ride/picnic with my husband. Is this something I can make the night before and keep in the fridge until the next day? I saw you said to serve immediately so I just want to make sure. Hey Caitlin, Yes I do think making it the night before would be fine! Just give it a good stir in the AM. Thanks for your kind words about the blog! Perfect fall smoothie! Looks absolutely wonderful Angela. Looks delicious! I make a similar smoothie with sweet potato! I cannot get dates to completely blend in smoothies! Any tips or tricks? I have a blendtec, so it’s pretty powerful. I even tried soaking them for about an hour before use. I blend dates for a longer time…just let the blender run a good minute, but I find in the Vitamix they do pulverize completely if I give it a good whirl. I’ve noticed that if I put the dates with a little liquid in the the blender and let them go for a while, like a full minute, and then add the rest of the smoothie ingredients, it gets pretty smooth. And i don’t even have a nice blender! This looks sooo good!! Yum! It looks yummy and healthy. I will try to make it. Love your blog. Anything with dates and cinnamon is going to be great. Sounds like a great smoothie for Fall! I’m a huge squash fan too so I’m going to have to try this! this looks like such a yummy treat, and so perfect for fall too! This sounds like such a great fall treat! Can’t wait to try! Anyone have thoughts on whether this could be turned into a pudding or custard? This tasted fantastic! I used fresh ginger instead since I had some. Thanks for another keeper! We had this this morning and it was delightful! So we made it again for dessert this evening only my husband wanted to try it with a baked sweet potato instead and it was also really good that way. Added a dash of nutmeg too. Great recipe a little like butterscotch pudding only way better. Hi Angela. The recipe looks and sounds delicious, but I was wondering if Stevia can be substituted for the dates for sweetness or do the dates also serve as a thickener? I’m a college student so I’m trying to work with what I have on hand. 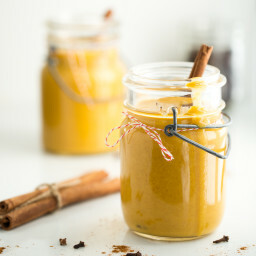 Also do you think if I used pumpkin purée and added pumpkin pie spice I could make a pumpkin pie vegan smoothie? Thanks!! This looks like the perfect fall smoothie! I can’t wait to give it a try! Yum! Can we use raw pumpkin instead of cooked? So comforting! Just had for breakfast! I will use more butternut squash next time though. Delicious & simple to make! Thank you Angela! Sounds delicious! I’m wondering if it would work as a dessert too, maybe with a bit less milk for more of a “pudding” consistency? I have half a delicata (honeyboat) squash leftover from the 7-vegetable “cheese” soup, and i was wondering if you think I could roast it (unpeeled?) and use it in place of the butternut for this smoothie? 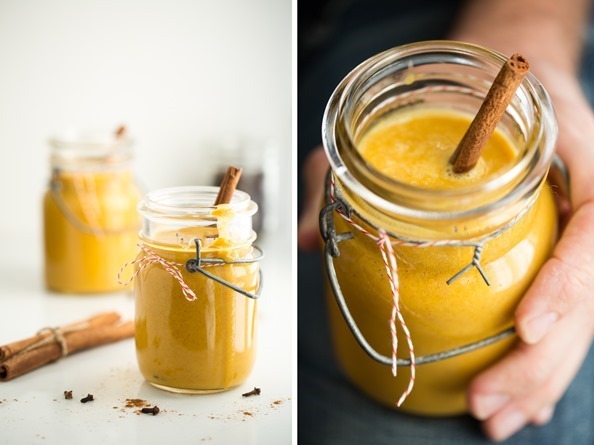 Awesome smoothie recipe and exquisite photos. And you are right, just perfect for Fall. This was amazing! I roasted the Butternut for dinner last night and there was plenty left over for this shake. Feels like I am eating a caramel milk shake. 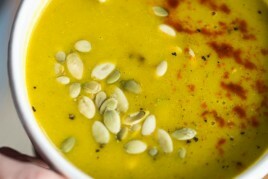 I used frozen butternut squash, omitted ice cubes and added hemp milk in lieu of almond….very good and quick! Thank you! Yummmmm! Made this today, and it was so good. I never would have thought to use butternut squash in a smoothie. You are so inventive! I didn’t have any dates, so I used a little maple syrup instead, and it was very delicious. I too have had problems getting dates to blend up in my vitamix but from reading your reply above it sounds like I just haven’t let them whirl around in there long enough. This looks and sounds heavenly for fall, thanks! I’m so happy you love it so much Adrian! My partner is the same as Elyse’s, he wont eat pumpkin but I reckon I can get him over the line with that amazing recipe. Thank you! I am going to make this for breakfast tomorrow. I am roasting the squash now!!! I sent this recipe to my best friend before visiting her for the weekend. She made this and we both thought it was the BOMB!! So good. Fast forward to today…..I cooked my squash, and told darling husband I will be picking up dates tomorrow for this and can’t wait for him to taste it. Oh I hope he likes it as much as I did. I tried this appealing smoothie recipe without the ice. I garnished the creamy pudding with a spoonful of toasted oates, walnuts, pecans, pinenuts, a pinch or two of organic can sugar and cinnamon – delicious! I have made several of your recipes since I discovered you a week ago. Wow! The endurance crackers are terrific and rich (filling). It is definitely missing something. While other people talk about how deliscious something is having never made it. I only comment after actually doing it. Mind you, I hate dates but figured these would add the right sweetness. They did. It was like soup only cold and that was weird. Kiddos concurred. How can we take this up a notch? Fresh Cranberries for a hint of sour and a pinch of cardamom? You are the flavor magician. And skip the ice cubes! my two cents, anyway…….. I was really interested to see your comment, I also prefer to read comments from people who have actually tried the recipe and I was wondering if it would taste like cold soup. I love squash but but sure that I will love it in a smoothie. Hi! Are those mason jars custom made? Do you make them? Thank you for the healthy recipes! You’re the bomb! Where in a walmart do I find chai seeds and ground cloves? Or are these ingedients I’d have to ask a WholeFoods employee for? Just made this! It’s delicious, very filling too. 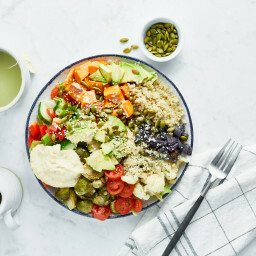 I am in love with your website and blog – my husband, mom, and I all tried our first Green Monster yesterday and today!! We loved it! So, I have never had butternut squash in a can before – in a pinch it might be good to have it on hand. Do you not need to cook that at all, or do you still cook that for this smoothie? Thanks you, I’m glad you liked the smoothie. No you don’t have to cook the canned puree butternut squash before going into the smoothie. I never thought of putting Butternut Squash, or as us Aussie’s call it; Butternut Pumpkin, in a smoothie before. Sounds interesting and worth a try, thanks for sharing. This is heavenly! Tastes like a fall-themed milk shake. So delicious and the very best part is it is so nutritious. I added goji berry powder. This is a great recipe. Thanks! I had some leftover butternut squash to use so I decided to give this a whirl. It was delicious! Wonderful smoothie recipe for the fall! I am presently sipping on this (sans ice cubes since my blender is a weenie) and it is SO delicious and tasty and yummy and scrumptious and slurperiffic. Thank you! oooh that sounds good. I still have a big can of pumpkin in the pantry awaiting its fate. The sage is beautiful in your photo! I’ve made this before and it was delicious, I eventually added some hummus and it was even yummier! Today I’m going to pour it over some quinoa and give that a test! Yum! 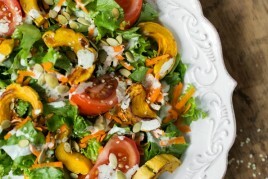 What a great use of roasted butternut squash! I’m wondering if my store bought frozen butternut squash is roasted? Love this recipe. It is now a staple in my breakfast smoothie file! The nutritional information is missing from your website however, and was wondering if you could provide. I’m on a mission to get more fibre in my diet and I’m sure this is loaded! Hey Marion, I’m so glad you love the smoothie! We’re in the process of adding nutritional info to the recipes…stay tuned. :) Thanks for your support!